Sri Lanka national teams, over the past four decades, had the services of at least a couple of Observer Schoolboy Cricketer main award winners. When Sri Lanka emerged world champions in 1996, beating Australia by seven wickets in the final, there were six Observer Schoolboy Cricketer of the Year award winners in that invincible team – captain Arjuna Ranatunga, Asanka Gurusinha, Roshan Mahanama, Kumar Dharmasena, Muttiah Muralitharan and Sanath Jayasuriya, who was adjudged the man of the series. 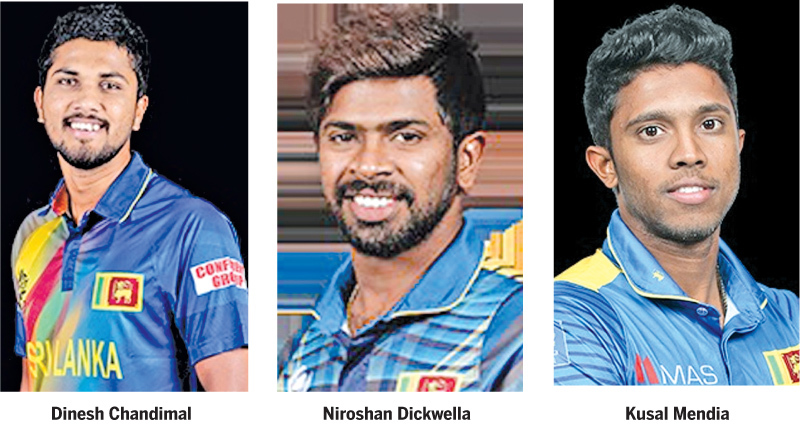 There is no exception this time around as the current Sri Lanka national team is studded with three former Observer-Mobitel Schoolboy Cricketer of the Year main award winners in Dinesh Chandimal (2009 winner), Niroshan Dickwella (2012) and Kusal Mendis (2013). Having made it to the Sri Lanka team just months after their crowning glory, the trio have become vital ingredients of the national team, cementing their places in double quick time. Sri Lanka Test captain Chandimal is the most experienced of the three, winning the prestigious Observer-Mobitel Schoolboy Cricketer of the Year title in 2009 when he was representing Ananda College, Colombo. Former Trinity skipper, Dickwella won the Observer-Mobitel Schoolboy Cricketer of the Year title in 2012. Kusal Mendis, who led Prince of Wales College, Moratuwa with distinction, was adjudged Observer-Mobitel Schoolboy Cricketer of the Year in 2013. Months later, he was chosen to captain Sri Lanka Under-19 team to Bangladesh in 2013. Twenty-year-old Chandimal has represented Sri Lanka in 46 Tests to aggregate 3,413 runs with an attractive average of 43.75, cracking 10 centuries and 16 fifties that included a career best knock of 164. In 139 ODIs, Chandimal has aggregated 3,433 runs with an average of 32.69. He has scored four ODI centuries and 21 fifties with a career best knock of 111. Following the footsteps of most other past recipients of the prestigious title, Chandimal made his Sri Lanka debut just months after he was crowned the Observer-Mobitel Schoolboy Cricketer of the Year in 2009. He did not get an opportunity for a long innings - made an unbeaten 10 on his ODI debut for Sri Lanka against Zimbabwe in Bulawayo on June 1, 2010, when the visitors had a nine-wicket victory. Chandimal is one of the most technically accomplished batsman in the Sri Lanka team who is capable of hitting the ball to all corners of the ground with a wide range strokes. Ever since his Sri Lanka debut, he has shown maturity at the crease with a good temperament to build and pace an innings. Dickwella, one of the most successful Trinity captains and a reliable top order batsman, signaled his entry to the big league by winning the Observer-Mobitel Schoolboy Cricketer of the Year title six years ago – having scored over 1,000 runs in the previous season. He is an attacking left-handed wicketkeeper-batsman. Dickwella, who turns 25 on June 23, has been particularly impressive in limited-overs cricket, ever since he basted an explosive 104 off 91 balls in the final of the Inter-Provincial One-Day Tournament in 2013. Just months after winning the main title at the Mega Show, Dickwella was selected to represent Sri Lanka ‘A’ in its tour of England in 2013. Since then, he has proved his class both as a top order batsman and safe hands behind stumps. Having made his Sri Lanka debut in 2014 against India in Ranchi, Dickwella has represented Sri Lanka in 36 ODIs to aggregate 1,074 runs with two centuries and five half tons with a career best ODI innings of 116. Dickwella is just ten runs short of reaching the milestone of 1,000 Test runs after figuring in 16 matches, producing eight half centuries that includes a career best innings of 83. In a recent interview, the Trinity Lion has said that winning the Observer-Mobitel Schoolboy Cricketer of the Year title was a great source of encouragement. “Winning the award was a great encouragement for me. It gives me great pleasure to learn that the contest has lasted for four decades. This has produced a bunch of some great cricketers in the All Island and Outstation competitions. Most of the recipients are doing well in their chosen professions, be in cricket or otherwise. My best wishes for a successful run of the contest in future”, Dickwella was quoted as saying. Mendis, who had scored many match-winning innings for Prince of Wales before he was adjudged the Observer-Mobitel Schoolboy Cricketer of the Year in 2013, too has shown good form with the willow. Even before he had stepped into the national team, his aggressive batting had earned him a large following. As a safe wicketkeeper and dependable right-hand batsman with an attacking bent, Mendis has often let his willow to do the talking. Just months after winning the Observer-Mobitel Schoolboy Cricketer of the Year title five years ago, he was appointed Sri Lanka’s under-19 captain for the Youth World Cup. He made his Sri Lanka debut with a blistering half century – scoring 51 off 59 balls with eight boundaries in Sri Lanka’s first ODI against Ireland in Dublin on June 16, 2016. Since then, Mendis has figured in 44 ODIs for Sri Lanka has scored 1,239 runs for an average of 30.97. He has one century and 11 fifties to his credit with a career best knock of 102. Representing Sri Lanka in 24 Tests, Mendis has aggregated 1,712 runs with four centuries and five fifties. He was the top scorer for Sri Lanka in the first innings in the recent second Test against Bangladesh in Dhaka. His brave 68 off 98 balls mainly helped Sri Lanka to take a vital first innings lead, which eventually won the match for them and with it the two-Test series. SLT Mobitel, the national mobile service provider, continues to provide that ‘smart connection’ to the Observer Schoolboy Cricketer of the Year Contest. Under the directions of the Chairman of the Sri Lanka Telecom and SLT Mobitel P.G. Kumarasingha, the Chief Executive Officer of the SLT Mobitel Nalin Perera has made a great contribution towards the success of the event during the past decade. The Observer-Mobitel Schoolboy Cricketer of the Year continues to enjoy the longstanding association of the Sri Lanka Schools Cricket Association (SLSCA) and the Sri Lanka Cricket Umpires and Scorers Association under the blessings of Sri Lanka Cricket (SLC), headed by Deputy Speaker Thilanga Sumathipala. The 40th edition of the Observer-Mobitel Schoolboy Cricketer of the Year contest is scheduled to be held in June. Incidentally, this will be the 11th consecutive year that the SLT Mobitel will be sponsoring the Mega Show, which has a rich history of producing legendary cricketers, including Sri Lanka’s World Cup-winning captain Arjuna Ranatunga, world’s highest Test wicket taker Muttiah Muralitharan and the Chief ICC Match Referee Ranjan Madugalle.